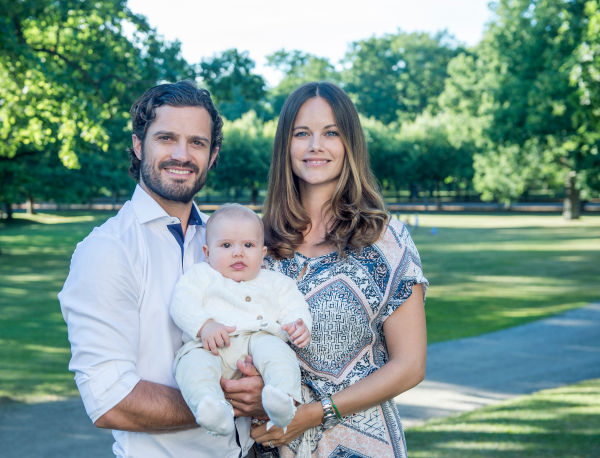 The christening of Prince Alexander of Sweden, the son of Prince Carl Philip and Princess Sofia, is scheduled to take place in the chapel of Drottningholm Palace in Stockholm on September 9. Ahead of the christening date, the Swedish court has released two new pictures of baby Alexander and his parents. The photos were taken by Kate Gabor. Sofia kept her jewelry minimal for the photos, wearing her engagement and wedding rings, a wristwatch, and the signature green bracelet of her charity, Project Playground. Intriguingly, you can also see that Sofia is clutching a string of beads in her hand; the three visible beads feature the letters L, E, and H.
The christening will be broadcast live on SVT, which usually also streams the event globally, so we should all be able to watch for any interesting jewels sightings. Here's a link to even more details about the day.